Do you want pastrami with that? A good pastrami sandwich has long been the calling card of a number of famous Jewish delis in New York City. Katz is probably the most well known, 2nd Avenue Deli is displaced but dependable, and Eisenberg’s, my unchallenged favorite until yesterday. 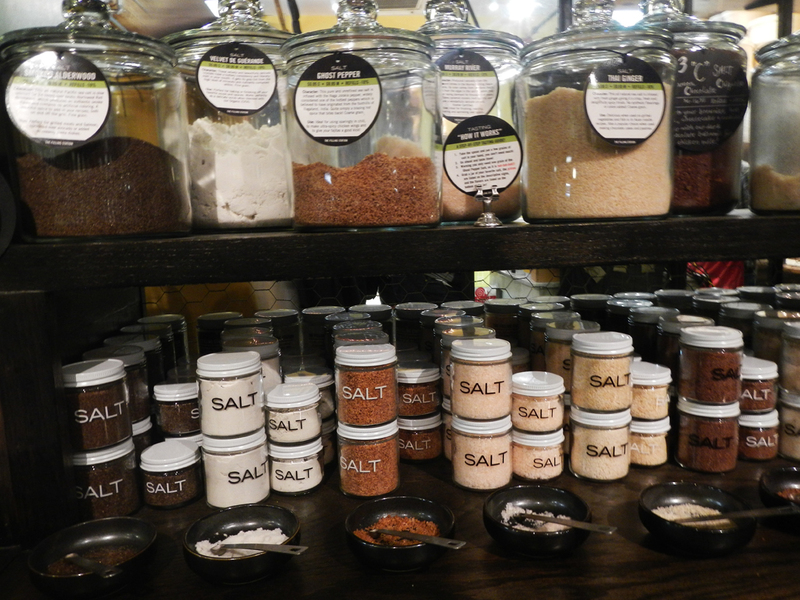 Now the ever evolving Chelsea Markets has a new tenant that is rivaling the old guard. Friedman’s is far from the traditional diner in appearance, looking very rustic with an open kitchen, a long wooden communal table and smaller tables at the back. There is usually a queue to get in, but this is a good thing as there are lots of wonderful distractions in close range. 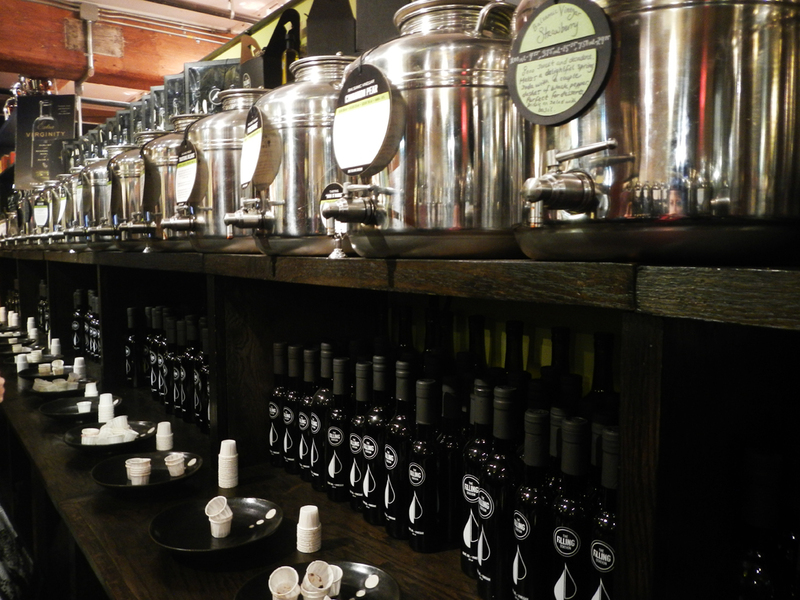 With a 45 minute wait, my lunch companion lured me to The Filling Station on the opposite side, a treasure house of oils, balsamic vinegars and salt – all for the tasting. The compact space is barrel to barrel temptation, with small taps and even smaller tasting cups to tantalize your taste buds. The dark chocolate balsamic was delicious and would be superb drizzled over perfectly ripe Port Lincoln apricots. 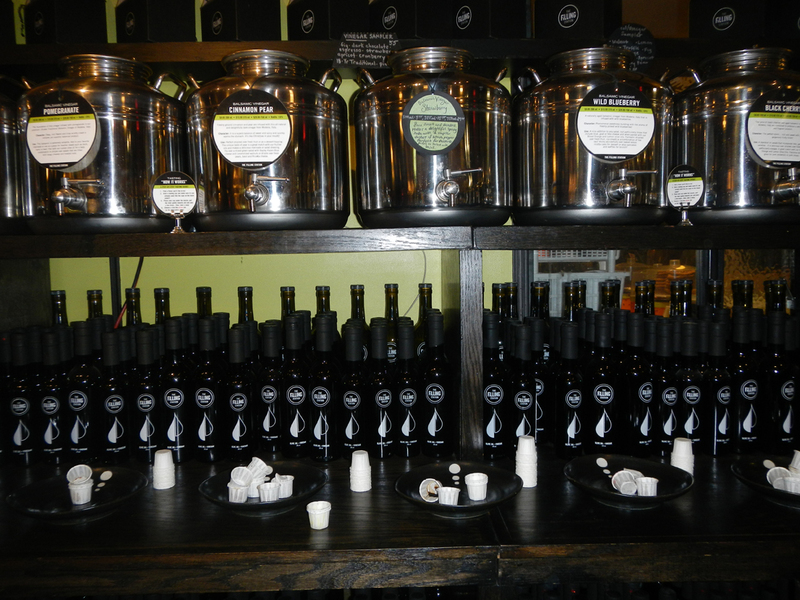 But the expresso and and fig balsamics were also outstanding, and I didn’t even get to try the honey & ginger white vinegar… We had to drag ourselves away to keep our spot in the queue, leaving only a moment to taste the salts standing next to my pink Murray River favorite. No comparison! 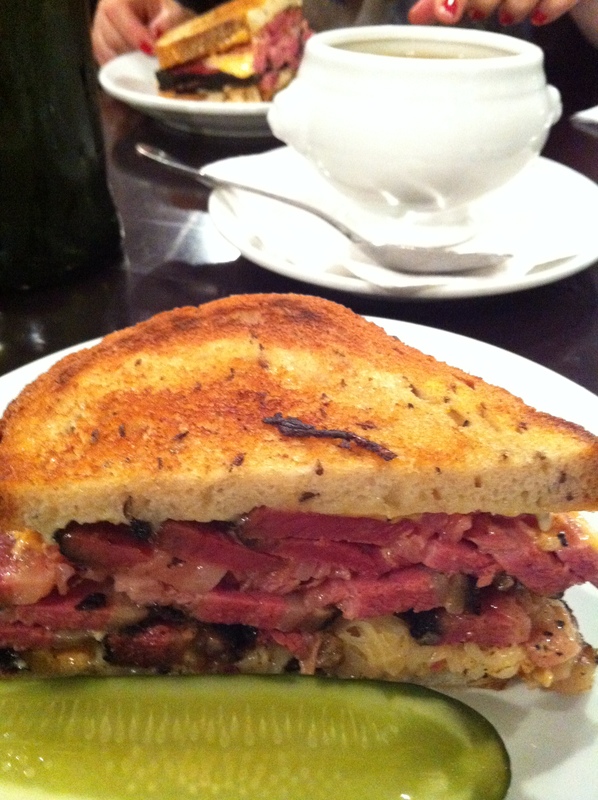 The pastrami sandwich came highly recommended and being a substantial portion, it was perfect to share. So there was no doubt that this would be our choice. However, I was hugely tempted to order a couple of other dishes just to see what they looked like. Friedman’s is not a Jewish Deli ( although their matzo soup was also very good ) – it is homemade comfort food with inventive dishes, and some of the combinations were for me a gastronomic extravaganza. Chicken and waffles came together as one meal, and the special of the day had to be repeated a couple of times so I could record and share it’s uniqueness. Pulled Pork Flautas. That is, pulled pork wrapped in corn tortillas, deep-fried, and served with a smoked tomato chili Ancho sauce, topped with pineapple salsa, 2 poached eggs and gremolta ( lemon zest, garlic and parsley ). Wow! 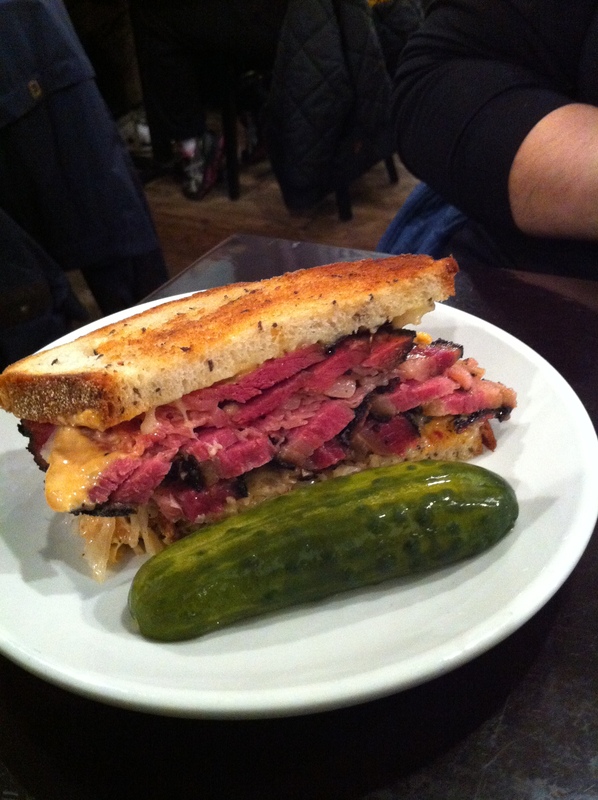 This entry was posted in Food, markets and tagged Chelsea Markets, Friedmans, pastrami NYC. Bookmark the permalink. 11 Responses to Do you want pastrami with that? Reminds me of my visit to Katz in 2003 with a dear friend! The photo of pastrami makes my taste buds yearn. Good to hear – there’s nothing wrong with pastrami for breakfast! I haven’t been back yet !